The Julian Day Planner generally tries to be amusing while providing a decimal time system for day-to-day scheduling of your time. 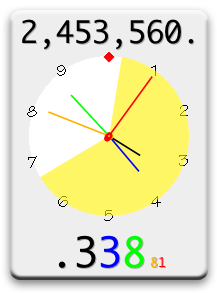 2,454,072 (2006-12-02): The widgets had a bug in displaying the day count when one of the three-digit groupings would have leading zeroes. I realize that the fix is rather late -- and that the next instance where it'll be needed isn't for another thousand days on the ones group and over 500,000 days in the thousands group -- but at least the fix is in. Earlier: I've recently updated the templates; they now use the free Blue Highway fonts, to increase the visual compatibility with the D*I*Y Planner templates. A new example month is below for March 2006. I've also put up some photos at flickr illustrating the features of the pages and my full planner kit as shown at my quasi-presentation at O'Reilly's ETech conference. I even had some press coverage from Michael Calore's Monkey Bites weblog for wired.com. Some years ago, the Swatch watch company decided to create "Internet Time", a 1000-beat day with its zero at midnight at the Swatch factory in Biel, Switzerland. I found this intriguing - a metric time independent of the sun's position seemed useful in today's world of graveyard shifts and cross-timezone communications. I found, however, that the arbitrariness of centering the numbers on their own factory was a bit too egocentric for me. But in reading about it, I discovered a much older system, the Julian Day system. The Julian Day system is a simple count of days (and fractions thereof) since noon on Monday, 1 January 4713 BCE on the Julian calendar. (This turns out to be November 24, 4713 BCE on the extrapolated Gregorian calendar, but hey.) It's used primarily in astronomy. As an example, 16 May 2005 is Julian day 2,453,507 (after noon in GMT). 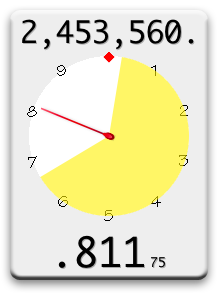 The day count is great for computer use; it eliminates any kind of Y2Kish boundary condition, at least until the signed 32bit MAXINT rolls around after JD 2,147,483,647 -- just short of six million years off. I'm sure we'll have 64-bit integers by then. But the fractional days seemed most interesting. Since I live in the Pacific Time Zone, the day turns over early in the morning (4am in standard time, 5am daylight), so the problem of noon-time day switching doesn't come up. I decided to see if scheduling could be done using this system. Use the Julian Day Planner like any paper organizer. On the outside edge of the page is room for appointments, with markings for each tenth of the day. On the inside is space for notes or a to-do list, and below that are listed worldwide holidays, the day in the Discordian and Mayan calendars, the times of the sun and moon's rising and setting, and a quick time conversion chart. The data on each page is generated by a perl script to determine astronomical data, look up diverse holidays, and plot obscure calendar conversions. 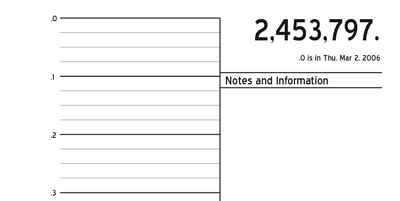 This is fed into an Applescript that fills the information into an InDesign form, managing the odd and even pages for proper front-and-back printing with space to punch for a standard 5.5x8.5" binder from DayTimer, Franklin, or what have you. The perl script takes as its input data the name of the user's location, the latitude and longitude of that location in degrees and minutes, and the time zone. It then generates the astronomical and calendar data, as well as the conversion table, using various perl modules; the holidays are generated by a call to the program gcal. Here's the calendar for March 2006, generated for the Springfield, Oregon area. For direct printing on 5.5"x8.5" paper. 2up, for printing on 8.5"x11" paper. The scripts and materiel will be available soon; I need to clean the scripts up to remove such things as hard-coded paths. At the moment, the system only works on OS X and requires InDesign CS and several perl modules. To make a complete day planning solution, I suggest you combine these calendar pages with the D*I*Y Planner, which provides a terrific set of templates and forms for practically all aspects of a paper planner system. Three decimal places of accuracy suffice to mark time with a minute-level resolution. Future refinements include a non-InDesign-dependent page generator and a web-based front end. gcal is capable of taking user-defined date lists, so you can add personal reminders such as birthdays and anniversaries. The Mayan calendar data may not be in accord with some other sources of Mayan calendar dates on the internet; this calendar is based on the more recently accepted correlation of 13.0.0.0.0 4 Ahau 8 Kumku equal to JD 584,285; many tools use the correlation of JD 584,283. Halfmoon.org has more information on Mayan calendrics, as well as a discussion of this issue. Phases of the moon are approximate and pegged to .0. My weblog is Wax Wolf Musings. Until I've got this all web-generated, I'd be happy to generate a couple of months of pages for people, with data at their locations; they would be sent as PDFs, either in 5.5x8.5" format for printing on pre-cut paper, or as two-pages-per-side for printing on 8.5x11" paper and cutting. I can be contacted at taperjdt@waxwolf.com.